Maryland Flags to fly at half-staff Tuesday, January 29th through the day of interment in honor of Delegate Hattie Harrison. Delegate Harrison represented District 45 in Baltimore City since 1973. She was the longest serving member of the House of Delegates. Note: Date of interment has been set and flags are to remain at half-staff through Saturday, February 9th. American Flags and Virginia Flags to fly at half-staff Sunday, January 27th through Tuesday, February 5th in the Commonwealth of Virginia in honor of former Chief Justice of the Supreme Court of Virginia, Harry Lee Carrico. American Flags and Florida Flags to fly at half-staff Friday, January 25th at the Capitol complex in Florida in honor of US Army Specialist Arandall L. Shears. Specialist Shears was assigned to A Company, 146th Expeditionary Signal Battalion, 83rd Troop Command, Army National Guard, Gainesville, Florida. Flags are also authorized for display at half-staff in Alachua County and the City of Gainesville. Rhode Island state flags to fly at half-staff beginning Thursday, January 24th through the date of her interment in honor of former Secretary of State Barbara Leonard. Former Secretary of State Barbara Leonard was called to public service. In addition to her tenure as Secretary of State, Barbara served, under Governors Garrahy and DiPrete, on the Boards of the Rhode Island Port Authority; the Rhode Island Economic Development Corporation; the Rhode Island Job Training Council; the Rhode Island Vocational Education Advisory Board; the Board of Commissioners of Public Telecommunications; the Rhode Island Advisory Committee on Refugee Resettlement; the Veterans Memorial Commission; and the Rhode Island Commodores. She also was appointed by President Reagan to serve as New England Regional Administrator for the General Services Administration. American Flags and Virginia Flags to fly at half-staff Saturday, January 26th at the Capitol complex in Virginia in honor of US Army Sergeant David J. Chambers. Flags are also authorized for display at half-staff in the City of Hampton and in any other locality as deemed appropriate. American Flags and Massachusetts Flags to fly at half-staff Thursday, January 24th in the Commonwealth of Massachusetts in honor of US Army Sergeant First Class Michael J. Squillaci. Five flags are on display today at the US Capitol for the 57th Presidential Inauguration. The current 50-star American Flag is centered with historic versions of the American Flag on each side. Moving out from the center 50-star flag are two 21-star American Flags. This was the flag from 1819-1820 and the 21st star represented the state of Illinois joining the Union. President Obama represents Illinois so this choice is appropriate. 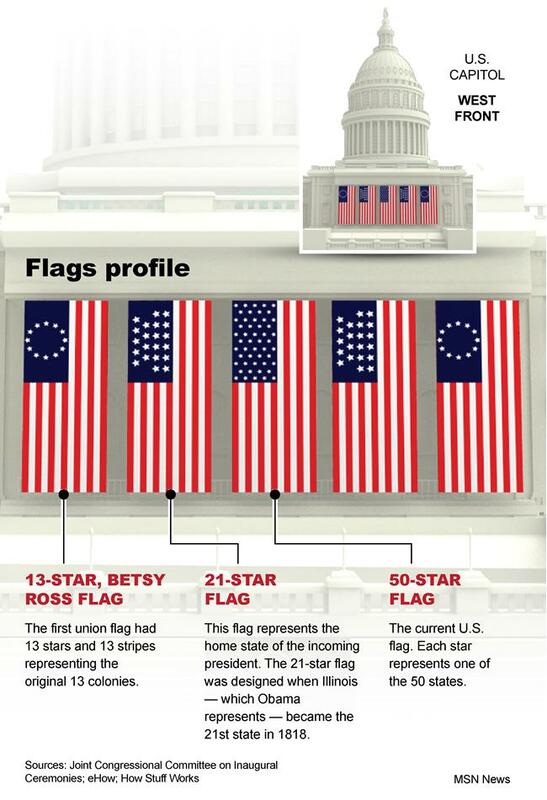 The two end flags are the 13-star Betsy Ross flags. The staggered 13-star flag was the first officially adopted design but the Betsy Ross 13-star flag is a more common visual representation of the original 13 colonies flag. All 3 versions of the American Flag on display today at the Presidential Inauguration are available year round on our website at www.allstarflags.com. American Flags and Oklahoma Flags to fly at half-staff Tuesday, January 22nd in the state of Oklahoma in honor of Retired Supreme Court Justice Ralph B. Hodges. Justice Hodges was appointed to the Oklahoma Supreme Court by Governor Henry Bellmon in 1965. He was the youngest person appointed to serve on the Oklahoma Supreme Court. He served two terms as Chief Justice, the first from 1977-1978 and the second from 1993-1994. He retired from the Court in 2004. American Flags and Massachusetts Flags to fly at half-staff Friday, January 18th in the Commonwealth of Massachusetts in honor of US Army Pfc. Antonio Syrakos. North Carolina State Flags to fly at half-staff Monday, January 14th in honor of NC State Senator Jean Preston. Preston served seven terms in the state House and three in the state Senate before retiring last fall. A native of Greene County, she represented Carteret, Craven, and Pamlico counties. Preston served as co-chair of the Senate Committee on Education/Higher Education and the Senate Appropriation Subcommittee on Education/Higher Education. She was the joint Republican caucus leader.